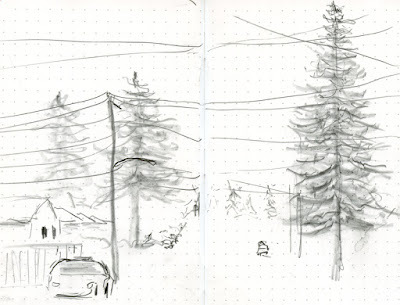 Winter weather curtails my sketching, but not completely. 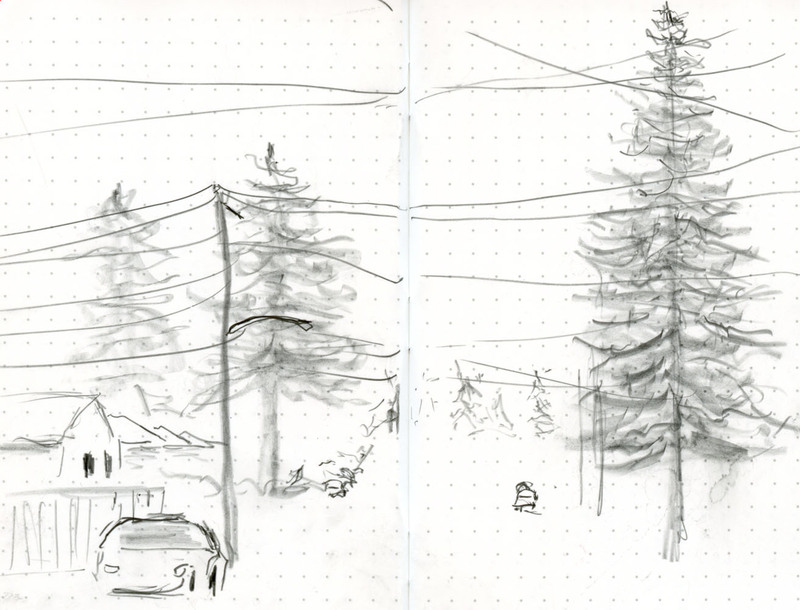 Since it typically doesn’t get deadly cold here, I can sketch quite a bit from my car. The only weather that really stops me is rain: Turning the windshield wipers off and on repeatedly is annoying, and it’s not pleasant standing in the rain. In addition, even watercolor sketchbooks don’t hold up well if you can’t decide where you want the water to go. But what if there were a sketchbook that could withstand rain? Last month in my post about the sketching materials I used during the Women’s March, I mentioned being prepared for rain by bringing a Field Notes Expedition notebook. Made of Yupo, a synthetic paper, the notebook is completely waterproof, inside and out, and very difficult to tear. It’s designed to be used by people who need to make notes while working outdoors in various weather conditions. I did a lot of Internet research and my own tests to see what kinds of drawing materials would work on the slick, plastic-y surface that cannot absorb liquids. Although a variety of pens can be used, some inks take a long time to dry on it. 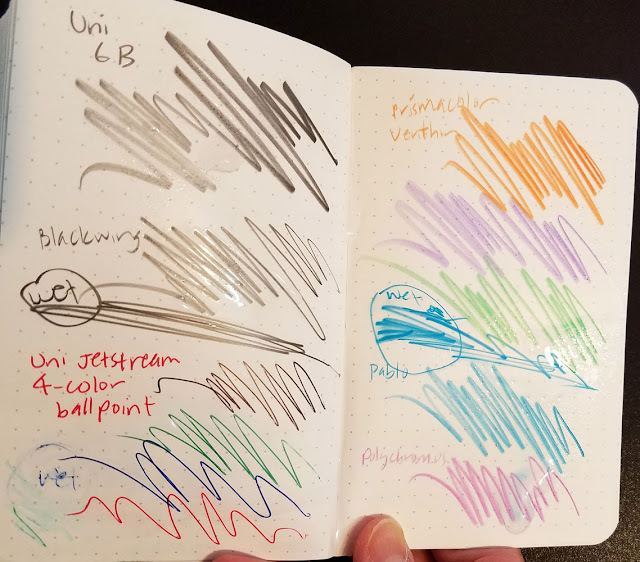 Many pens with waterproof ink like Sharpies and brush pens will draw well on it while the paper is dry, and once the ink has dried, it will be waterproof if the paper gets wet afterwards. 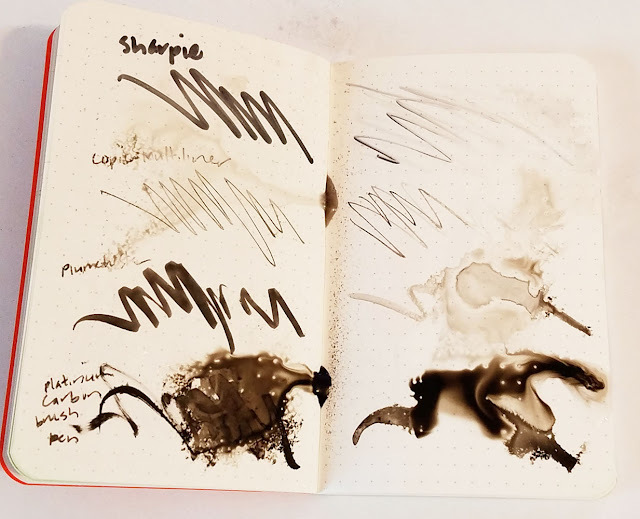 But if you try to write on wet paper with these waterproof pens, the ink won’t stick – it just floats away. On the left side of my test spread below, I used a Sharpie, a Copic Multiliner, a Plumchester brush pen and a Kuretake brush pen containing Platinum Carbon Black ink (all waterproof inks) to make some scribbles on dry paper. I waited a bit to allow the inks to dry, and when I thought they were, I sprayed the page with a water spritzer. The Sharpie and Plumchester were dry, so the water didn’t affect them. The Copic Multiliner must not have been completely dry, as it smeared a bit. The brush pen with PCB ink looked dry but must have been quite wet, because it made a beautiful bloom. On the right, I sprayed the clean page with water first, then tried to write on it with the same four waterproof inks. As you can see, none was successful. Most reviews I’d read said that graphite pencil and ballpoint pen fared well on Expedition paper, and my own test results partly concur. On dry paper (below), I used a couple of soft grade graphite pencils and a Uni-Jetstream ballpoint pen to scribble on the left side. On the right I used a few different types of traditional colored pencils. Then I sprayed the page spread. As expected, water did no harm to the pencil or ballpoint scribbles. While the pages were still wet, I went back in with the same instruments to try scribbling again (those marks are labeled “wet”). While the graphite and colored pencils all did well, the ballpoint pen didn’t. I don’t really care for the way colored pencil looks on Expedition paper, and without any tooth, it’s hard to build up color. But strangely enough, I do like the way graphite goes on the paper, especially the softer grades – rich and dark – and it feels surprisingly pleasant. Despite the lack of tooth, it goes on well, stays on when wet and – most important – draws on a wet surface. With laboratory testing done, it was time for a field test. You’d think I’d have plenty of opportunities in Seattle for field testing (and you’d be correct), but I was waiting for just the right rain conditions. I didn’t want to get drenched, so forget about the many downpours we’ve had recently. And I didn’t want to freeze, either, so I skipped the cold, wet days, too. Then a few days ago it was just right – mild temperature but drizzly. On my way home from the post office, I stopped in the View Ridge neighborhood, pulled up my hood, and got out of the car. 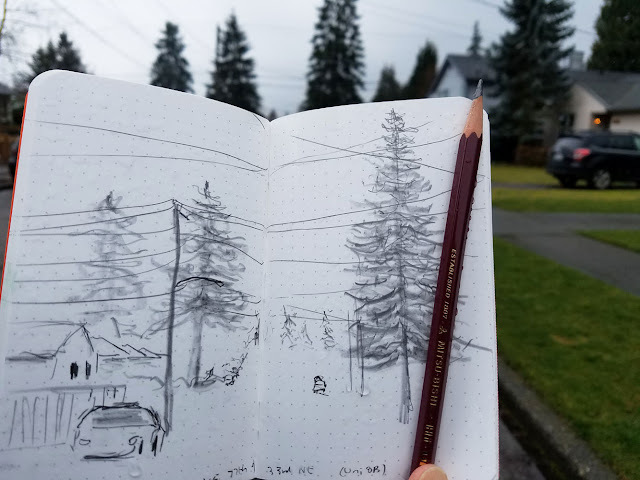 Using a Mitsubishi Hi-Uni 6B pencil, I scribbled the street scene, watching the drizzly drops cover my page. The pencil did beautifully, both while the page was relatively dry as well as toward the end of the sketch when it was dripping. When the page spread completely dried, it was as good as new – you can’t tell that it was ever wet (see scan at top of page). Using watercolors, artists like Joan Tavolott make paintings with gorgeous effects on dry Yupo paper. And now sketchers like me have no excuse on rainy days – Yupo paper is great for drawing on wet, too! Note the rain dripping down my pencil and on the page surface!